Today I present to you one of my favourite recipes- it’s the best Palak Paneer you will ever make! I promise! When you grow up eating something everyday, you tend to automatically assume you know how to make it.At least I did.For the longest time I made Palak Paneer without thinking.It used to be dark, have an irony taste to it.I only made it when I felt my body needed extra nutrients or when I remember Popoye. Then, as I started diving deeper into the culinary world I found some tricks of the trade.Especially when working with Spinach.Unlike me, you don’t have to re invent the wheel because I am going to tell you all the secrets of the best Palak Paneer Ever! How to make the best Palak Paneer Ever! The first thing– there is nothing more off-putting than sandy gritty texture in food.So always always wash your spinach till you can’t see anymore mud in the water.I usually do this in batches.This step is very very very important.I can’t tell you how many times I have skipped or skimmed on it and felt sorry!So Wash Wash Wash your Spinach! Oh and the Third thing- Prepare your paneer.Most often the paneer we get in the market is hard or not as fresh as we would like it to be.But this is rectifyable. 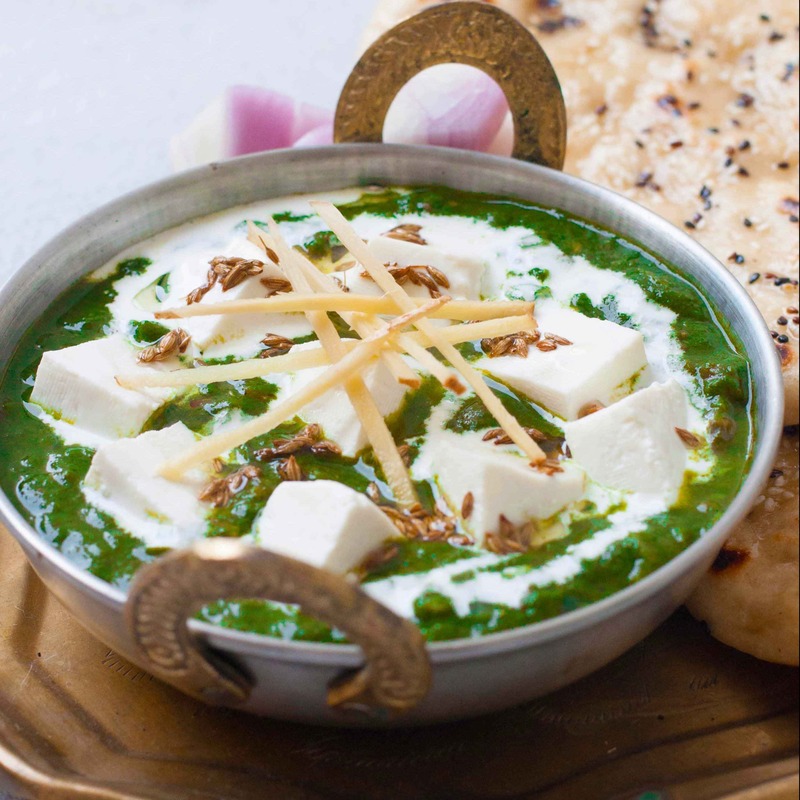 Cut and submerge the paneer in warm water till you prepare the palak gravy- This would make sure its soft and supple. Now the other thing – I like my palak paneer with some body and texture and hence I use chopped onions and tomatoes to make the gravy but if you like silky smooth palak paneer -then Puree your masala before adding the palak puree. To make the Palak Paneer Vegan- Swap tofu for paneer and to make it vegan- Use either cashew cheese or mushrooms,peas or any other vegetable instead of the Cottage Cheese. Skip the addition of Fresh Cream from top to save some extra calories. The best Palak Paneer Recipe - Dhaba Style - Easy to make recipe of the Famous Indian dish made with Spinach and Cottage Cheese.Best served with Rice or Naans. Cut the paneer into cubes and submerge in warm water. Boil water in a large pot.Also prepare a bowl of ice cold water. Using Tongs(Chimta) submerge 1/4 spinach in boiling water.Wait for 30 seconds.Take it out and submerge it in a bowl of iced water.Repeat with the rest of it. Squeeze the water out of the spinach(as best as you can). Puree it and set aside. Heat the oil in a pot.Once hot, add the Cumin.As it starts to splutter- add the asafoetida,Green Chillies and the red chillies. Add the Ginger & Garlic next- Sauté for 20-30 seconds.Follow this with chopped onions. When the onions start to brown ,Sprinkle in the garam masala, coriander powder &red chilli powder. Mix everything together and cook for barely 10-20 seconds before adding in the chopped tomato. Add the spinach puree, Salt & lime juice.Cook only till the spinach gravy starts to boil. Add the cubed Paneer and drizzle over the fresh cream to serve. To make the palak paneer gravy silky smooth- Grind the onion tomato masala before adding the spinach puree. Hi Dear Ashwini! It means a lot to me that you wrote back on the blog with your reviews.I cant tell you how happy I am that you liked the recipe.Much Appreciated!! I heard that this was an absolutely delicious dish, and I am curious. Isnt it wonderful that there are so many ways in the world to make food. Is your recipe hot? meaning you put red pepper or hot palak? This Indian dish combines fresh spinach and ricotta in a creamy palak paneer. Use paneer if you can find it! It is absolutely wonderful with basmati rice or naan.